Protest against UK arms sales to Israel on November 21, 2014 in London. Source: BDS Movement Website. Alongside the often-cited examples of Saudi Arabia, Bahrain and Israel, weapons made in the UK have also been sold en masse in Mexico, where murders, mass disappearances, and mass displacement of civilians in the ongoing drug war have made the country one of the most violent on earth. The UK's security and military export licenses to Turkey were valued at £466 million from 2013-2016 and have been used in Turkey's widespread, brutal repression of civil society and Kurds. Through “open” trade conventions such as the Security & Policing (S&P) exhibition and closed events such as the Defence and Security Equipment International (DSEI) fair, the UK allows local and international companies to showcase some of the world’s most lethal weapons. The UK is also home to one of the world's leading suppliers of surveillance software, Gamma Group. The “Stop The Arms Fair!” network, a group of activists who sought to stop the upcoming DSEI fair in September 2017, recently highlighted the UK's role in routinely selling surveillance gear and weapons to governments notorious for abusing human rights including Saudi Arabia, Bahrain, Ethiopia, and Venezuela. The Government has approved more than 152 licences to export non-lethal arms abroad since 2010, including some £182,000 of tear gas or irritant ammunition due to be sent to Saudi Arabia in 2015 and crowd control ammunition worth £6.1m cleared for sale to the United Arab Emirates in 2014. As the UK negotiates its exit from the European Union, it has its sights set on expanding this arena, according to both the post-Brexit green paper and one of the ministers for Exiting the EU, Member of Parliament David Jones. The UK wants to make it illegal for public bodies with government funding to boycott, divest from or sanction an industry or state. In response to this guidance, one of the largest trade unions in the UK, UNISON, emphasized: “Investment policy should be a matter for the scheme members and their decision makers, not for a government to intervene”. Last year, the Pensions and Lifetime Savings Association that represents over 1,300 pension schemes also stressed that these rules could hamper the best interests of pension fund members. 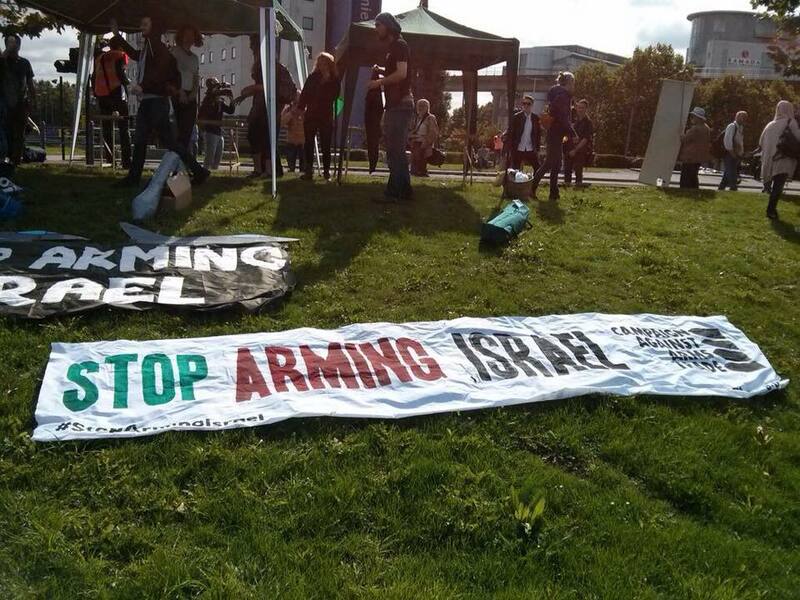 ‘Stop The Arms Fair’ protest against UK's arming of Israel on September 7, 2015. Source: Facebook. Many campaigns recognize the historically crucial role of local councils in furthering human rights and in strengthening processes that impact international norms. In the 1960s and 1970s, more than 100 local authorities in the UK opted to ban South African goods, and in 1981, Strathclyde Council ceased its pension fund investments in companies with South African subsidiaries. Ryvka Barnard, a Senior Campaigns Officer at the UK-based ‘War on Want‘ activist organisation, says that the UK government has explicitly targeted the Boycott, Divestment and Sanctions (BDS) Movement — which, among other things, calls for an end to Israel's occupation of Palestinian land — and anti-arms trade movements as part of a general crackdown on human rights and consumer choice. The UK regulations currently hone in on fossil fuels, tobacco products, products made in Israeli settlements in the occupied West Bank, and companies involved in the arms trade. Yet Andrew Smith of CAAT maintains these curbs could have serious repercussions on all campaign groups. The main thrust of the boycott ban in the UK is to eliminate pressures from calls for a two-way arms embargo on Israel by groups such as War on Want and from councils to boycott Israeli settlement products. Hence, the anti-boycott law will force publicly funded institutions to submit to the UK’s foreign policy interests; an illuminating move in light of its arms trade, particularly when it comes to Israel. The anti-boycott law will force publicly funded institutions to submit to the UK’s foreign policy interests. UK arms applications for export licenses are supposedly “assessed on a case by case basis against strict criteria,” with prohibitions against arms used for external aggression, internal repression or other criminal behavior. But the terms under which a specific weapon is classified as such are murky. In practice, it appears that minimal reviews take place. The criteria for assessment are open to broad interpretation, and very few arms export licenses have been disallowed or revoked. Barnard has emphasized that the UK does not adequately regulate arms sales: while it highlighted Israel as a country of concern through its own assessment process, in 2016 it approved over £100 million in arms exports to Israel. The UK-Israel arms trade is mutually beneficial and extremely profitable to both governments. With its military sector composed of over 200 private and public companies and advertising that promises weapons that are “combat-proven in the Occupied Palestinian Territories”, Israel has become the leading exporter of drones in the world. In 2012 it was ranked as the sixth largest arms exporter; with the value in its exports doubling from US$3.5 billion in 2004-2007 to US$7.1 billion from 2008-2011. Israel sells arms to the UK valued at millions of pounds, and the IT security firm Elbit Systems assisted in providing the UK with US$110 million of drone technology for its use in Afghanistan and Iraq. At the same time, the Israeli military and Israeli companies rely on specialized UK defense companies for ‘dual use’ weapons that can be used for both military and civilian deployment. This report includes details on the role of G4S, one of the largest security companies in the world, based in the UK. 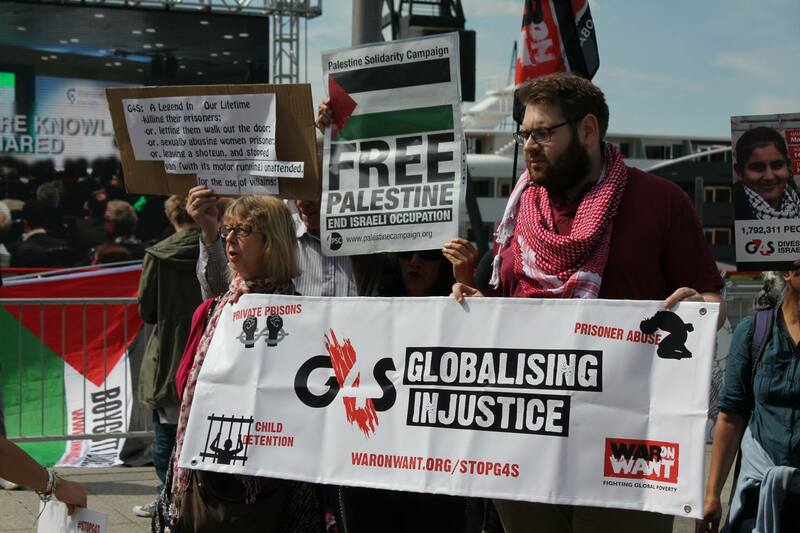 Accused of complicity in a range of abuses, in 2014 the company terminated some aspects of its work with Israel; however, the campaign against G4S in Israel is far from over. In 2005, the Minister of Defence granted a venture contract worth almost £1 billion to the UAV Tactical Systems Ltd (U-TacS), an undertaking by Thales UK and Elbit Systems. This ensured the development of the UK’s Watchkeeper WK450 surveillance drone, which War on Want warns is based on a model that was “field tested” on occupied Palestinians during attacks on Gaza. The UK also approves licenses for companies that sell components of weapons to Israel, including the Hermes drone. The Israeli Defense Force (IDF) uses this drone to both monitor and bombard Palestinians in Gaza. This was especially evident during Operation Protective Edge in 2014 in which approximately 1,460 Palestinians were killed. The UK not only provides Israel with drones and drone technology, weapons components, weapons control, targeting equipment and ammunition, but also bulletproof garments, small arms ammunition and armored vehicles, many of which are used to target, kill and repress Palestinians. Where’s the incentive for companies to ensure there are no human rights violations…when public bodies cannot hold them to account by refusing to award them contracts?